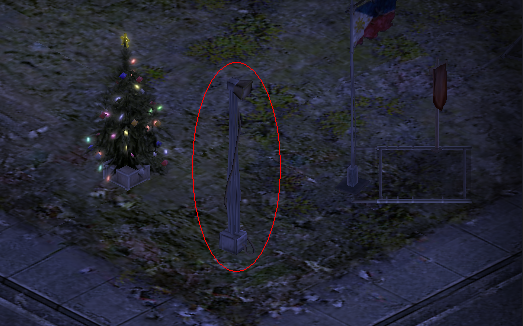 It seems that the Dynamic Lighting is not working. 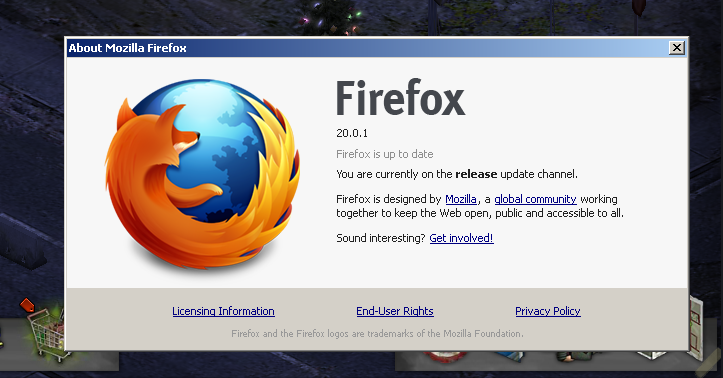 I'm currently using Mozilla Firefox 20.0 and the latest version of Adobe Flash Player (debug player). Is it enabled? 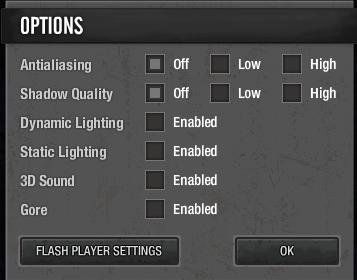 Go to the settings panel (click the cog icon, near music and fullscreen, etc), and make sure Dynamic Lighting is enabled. Dynamic lighting is working for me on Chrome, maybe you could try switching to another browser. 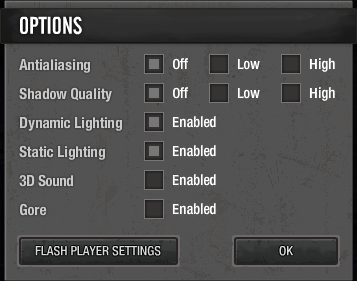 Or as the dev has suggested, check if you have Dynamic Lighting enabled in the settings. Mine isn't working with Dynamic lighting as well. Tried clearing all the cache but it doesn't work. Using Chrome 26.0.1410.43m and adobe flash player 11.6.602.180 (Not the one it comes with Chrome). Mine DL is also not working anymore. It started from a couple of update back (either Bounty or Clothes). With Dynamic lightning activated, I can see all floodlights lighten only when watching at other player's compounds, but my own doesn't light anymore. Also, gun tracer doesn't work like before. But game crashes are less frequent. Edited by Takata, 10 April 2013 - 07:49 AM. I turned it on and off a few times but nothing happens. The Floodlights don't light. Edited by Nebulae Xard, 10 April 2013 - 07:50 AM. Try to reset your browser with the "Dynamic Lighting" ticked and see if it works, it happens to me sometimes, I just click the lighting and reset the browser and it works, same could be applied if you want it to be turned off. Edited by Rain08, 10 April 2013 - 07:52 AM. I tried that because I had this problem for maybe a couple of days now when I'm playing in my house. Now I'm playing in an internet cafe and still. Edit: I'll try to upload/provide a screenshot when I get home. Edited by Nebulae Xard, 10 April 2013 - 08:08 AM. Did you reset it with the dynamic lighting ticked? If you didn't, tick that before resetting your browser and see if it works again. Well... I can see my floodlights now! I switched map and compounds views and it seems to make them lightening. simply changing the mode settings isn't enough to activate the DL mode. Floodlights still working or not working. It seems related to Ghostery add-on under Moziilla. 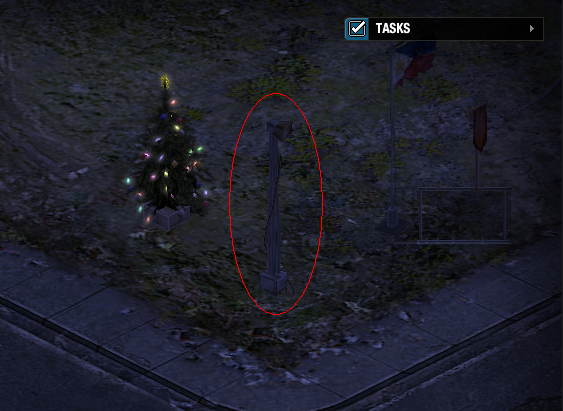 Also, Ghostery will prevent my survivor deployment during a raid. The red spot "connecting" will turn forever and the mission will never launch. So here are the screenshots I prepared. Edited by Nebulae Xard, 17 April 2013 - 04:04 AM. Have you tried leaving the compound, then returning? Or leaving the compound, then enabling Dynamic Lighting, then returning? Does that work for you? EDIT: I can confirm this is an issue. Looking into it now. Moved to Known Issues.